.....so you might as well not fight 'em. By blues, I mean the colour, not the emotional state. 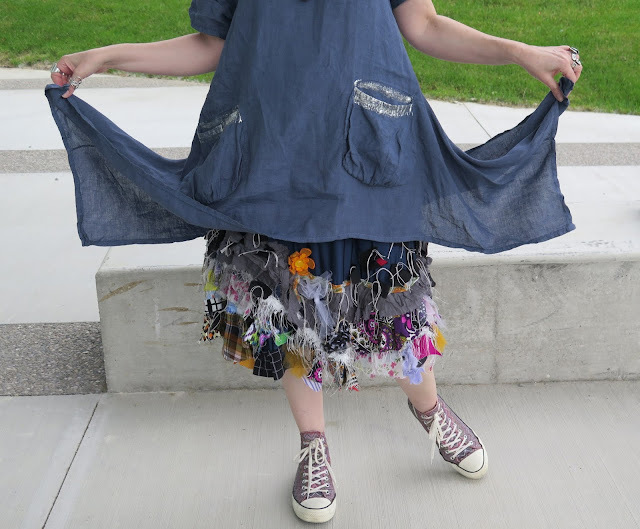 Summer is usually the season when people break out the bright colours and bold prints, but for me, the past couple of summers have seen a lot of black and grey. 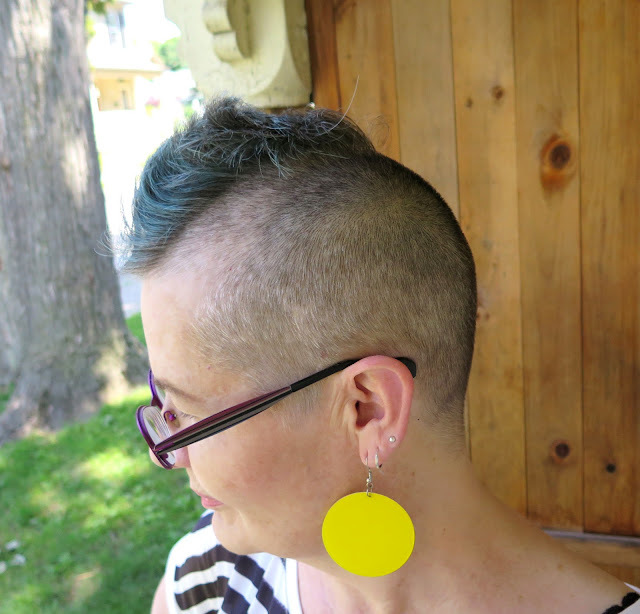 I'm trying to break out of that rut by adding a colour or two, and the one colour I have gravitated to is blue. Not pale blue, or navy blue, but a rich denim blue. You've seen these wide leg pants on my blog many times as they get worn all year round. I think if they ever wear out I will have to get someone make a pattern from them so they can be re-created. 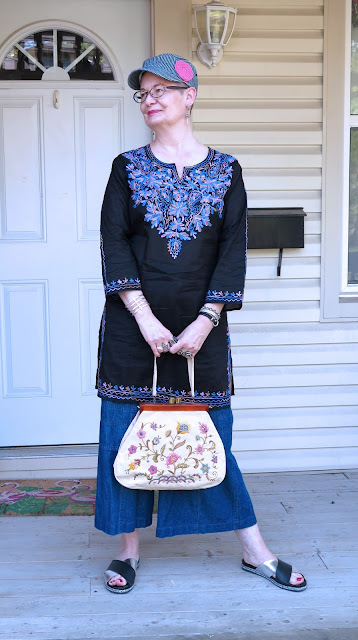 I found the embroidered cotton tunic at a Salvation Army thrift store in Toronto during a "50% off Everything" sale, so it ended up being $3 or $4. The cotton is so fine you can see through it. I found the hat at the Uka Market booth at the Horseshoe Flea Market in Denver. The sun was blazing hot that day and my head felt like it was toasting (one of the downsides of having very short hair) so I purchased one of their cotton brimmed caps. 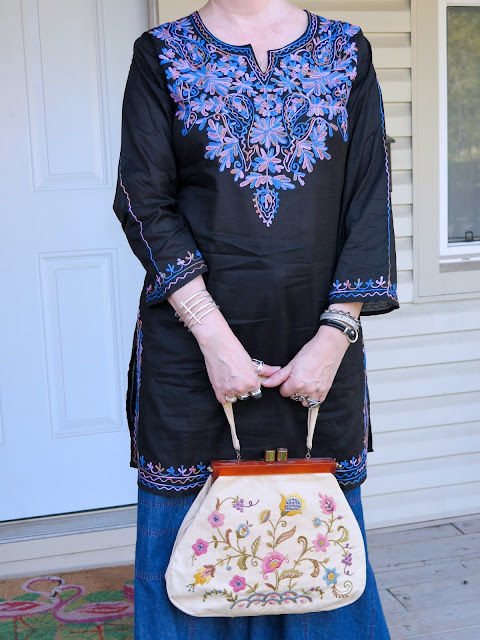 A closer look at the embroidery on the tunic and on my vintage bag, which came from one of my favourite local purveyor of treasures, The Sentimentalist. I purchased this linen tunic/dress at From Mars at the end of last summer. The colour, high comfort factor, and the metallic silver trim on the pockets sold me on it, and it has become a great layering piece. 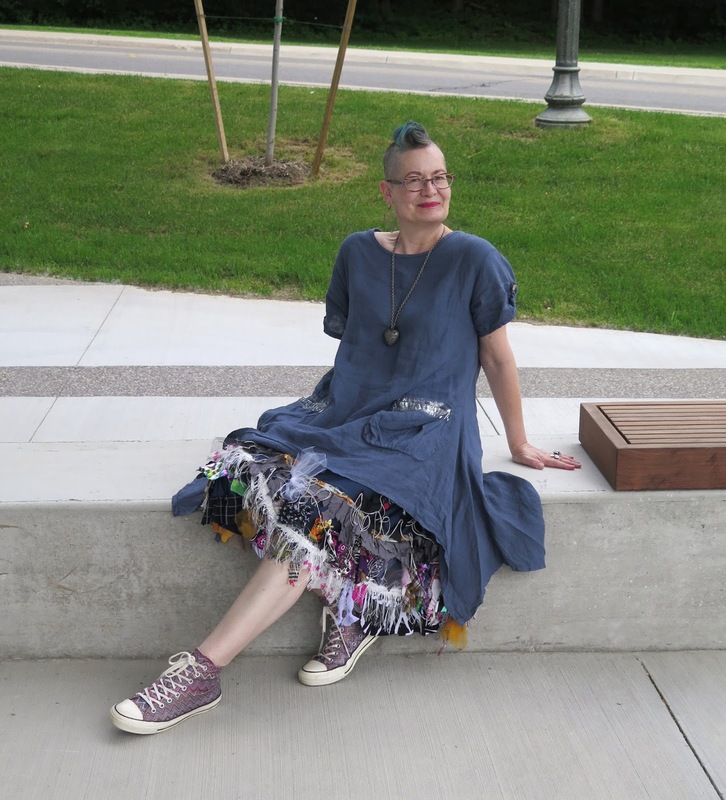 When I was in Denver I received a package in the mail from my friend Carmen Bury, and one of the things in it was this embellished skirt she had made. 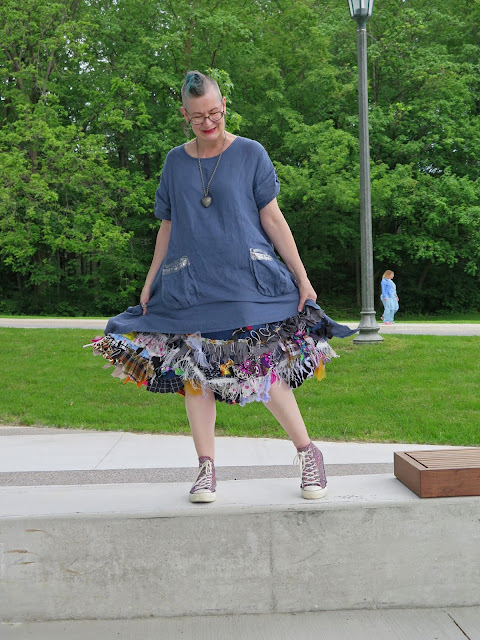 The skirt itself is a polyester jersey with a drawstring waist, and Carmen hand sewed all the bits of colourful fabric to the bottom. The weight and nature of the fabric means that the skirt has amazing swish-ability. I may have been a bit obsessed with swishing it back and forth day, and if you follow me on Instagram, you can see a video of me doing just that. I had tried some turquoise tinted hair spray on my hair and was happy with the results, so this weekend I decided try L'Oreal's Colorista Semi-Permanent Colour in Teal. It is supposed to last 4 - 10 shampoos so I'll see what it looks like at the end of the week.